Finish: Antiqued as per picture. We provide wide range of sextants, which are used to measure the angle of celestial bodies above the horizon. 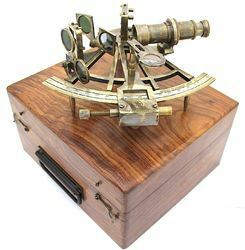 These sextants are manufactured using high quality raw material such as brass, which enhances their durability. 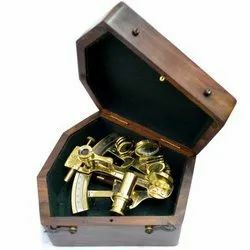 Sextant brass antique with wood box 05 inch size. With rich industry experience, we are presenting our clients a broad range of Brass Polish Sextants ST – 2491113. These products are highly technical and sophisticated products that are manufactured from standard raw material that is sourced from our reliable vendors and suppliers. Our product range is valued for its fine finish and dependable performance. We are offering a wide range of Nautical Sextant to our customers as per their requirements and to the full satisfaction of them. the perfect collection for any office and home.